Crispy fried bacon, fresh tomatoes and lettuce are the main ingredients for this easy, classic lunch idea. Can you think of anything better to do with your fresh picked tomatoes? 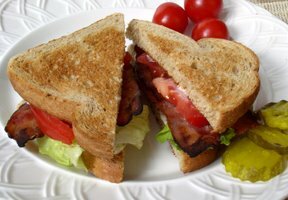 Nothing beats a BLT sandwich made with home grown tomatoes. Enjoy your summer harvest. See step-by-step instructions on how to cook burgers using the direct grilling method. Check out our tips and ideas for creating the perfect burger. Surprise your family and friends with some special burgers at your next cookout.